The creation of this high protein supplements had two objectives: to deliver a very high concentration of proteins in the formula with a delicious flavor and enable the consumption of protein giving the fastest, the maximum increase in the concentration of amino acids in the bloodstream that is, rapid introduction of the muscles in a state of anabolism. 188 loyalty points Your cart will total 188 points that can be converted into a voucher of 7,52 PLN. 100% Whey Isolate is designed to maximize the concentration of protein in the product flavor and full and rapid protein synthesis in the muscle cells. The product is low in lactose, fat and węglowodanów.Charakteryzuje an excellent solubility (instant). Whey protein isolate is a particular source of the protein content of which is 100% Whey Protein Isolate has a unique amino acid absorption kinetics, allowing the whey peptides are actively transported into the bloodstream and your muscles. This means faster, better amino acid absorption and thus better training effects. 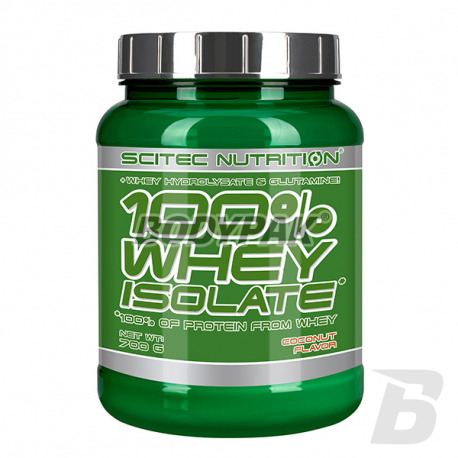 Scitec Isolate with low content of lactose, fat and carbohydrates. It is also very convenient to use because it can mix an ordinary spoon or bottle, it is not necessary to blender or shaker. 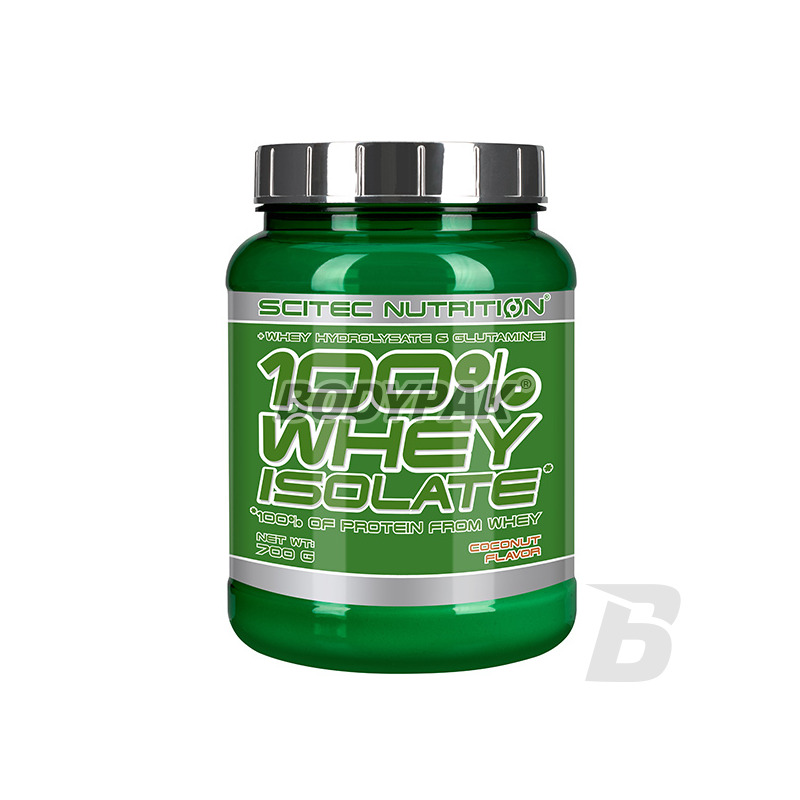 Scitec Nutrition Isolate contains pure whey protein isolate of the highest possible nutritional value determined coefficient of BV-159 (ion exchange isolate, isolate and ultra micro filtered, hydrolyzed whey protein peptides). Whey proteins have a high content of essential amino acids, ie. Glutamine and BCAA, which represent 25% of all tickets! Special protein fraction used for the production of Scitec Isolate forms acid peptide linkages that are easily transported to the muscles. Faster and greater absorption of amino acids means a faster and stronger effect. 100% Whey Isolate is low in lactose, fat and carbohydrates therefore ideally suited as a supplement to low-carb diets aimed at improving the quality of profiles, strengthening muscle and reducing fat. Consume 1-3 servings daily, preferably after training and local food of the poor in nutritious proteins. Consume 1-3 servings daily, preferably in the food of the poor in nutritious proteins. Ingredients: microfiltered and ultrafiltered whey protein isolate (made from milk , emulsifier: soy lecithin ) containing fractions Milk : beta-lactoglobulin, alpha-lactalbumin, bovine serum albumin, immunoglobulin G, lactoferrin and glycomacropeptides, flavor (raspberry), L-glutamine, sweeteners (acesulfame K, Suklaroza), acidity regulator (citric acid), whey protein hydrolyzate (manufactured milk ), dye (Ponceau 4R). Ponceau 4R - may have an impact on activity and attention in children. Smak malina petarda szczególnie z mleczkiem, polecam! co mogę powiedzieć o tym białku to jedno, że już go nie kupie mam to białko o smaku waniliowym jest słodkie jak miód jak dla mnie za słodkie i mdłe po za tym troszkę słabo się rozpuszcza. Uważam, że jak za tą cenę, to smak jest koszmarny, chyba najgorsze w smaku białko jakie miałem, są znacznie tańsze i dużo lepsze. Smak malina zawiera koszenilinę jako barwnik, co dla mnie dyskwalifikuje produkt. Bardzo słodkie i chemiczne, więcej nie kupię. Super białko cenowo i smakowo! kupiłem czekoladowe i bardzo mi smakuje 0 grudek dobrze się rozpuszcza nie powstaje piana. ja też dodaję sobie miareczkę do omleta i świetnie smakuje :) daję solidną 5! Jeden ze smaczniejszych izolatów jaki piłem do tej pory. Malinowy na prawde świetny zarówno do porannego shake'a z owocami, jak i po treningu - super ! Moim zdaniem zbyt mocny, chemiczny posmak. Bardzo słodki, takie lubie, ale za bardzo czuć chemie. Rozpuszcza się świetnie! Smak delikatnie chemiczny, co jest jedynym minusem tego izolatu. Poza tym - bez zastrzeżeń. Smak malinowy - jeden z lepszych, jakie piłem. Dobrze się rozpuszcza i robi swoją robotę po treningu :) Warto rozważyć większe opakowanie bo te 700g szybko schodzi. rozpuszczalnosc w szejkerze 5/5 !